Just like LEGO or Minecraft, build anything you can imagine in wonderfully rendered 3d. And it is easy, just stick block onto each other and watch your creation come to life. The user interface is so intuitive that even a 4 year old can use it. Build whatever you can dream up and BlockArt will make sure that it looks gorgeous. Try it out, you won't regret it. - Add blocks with a single touch. - Use paint and fill to change colors. - Camera zoom and rotation control. - Advanced interactive lighting and antialiasing. 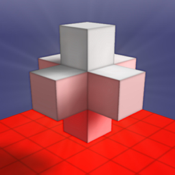 - Radiosity and background shadow calculation. - Save high quality pictures to photo album or Facebook. - Quick switching between adding and deleting blocks.